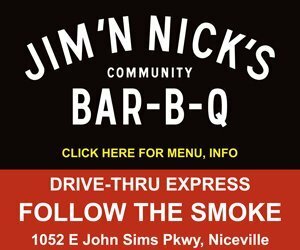 This year, make Valentine’s Day special for your Valentine by going beyond flowers and candy, and without leaving Niceville. You will find distinctive, affordable gifts for last-minute shopping in Niceville at both JD Jewelers and Trinity Gallery & Gifts. To cap off the day, enjoy a memorable dinner with your Valentine at DoModachi Japanese Steakhouse & Sushi Bar. The perfect Niceville Valentine’s Day! JD Jewelers is Niceville’s locally owned and operated jewelry store, located at 1129 John Sims Parkway East, in the small shopping center directly across the street from Po Folks. JD Jewelers is owned and operated by Jason and Cindy Deshotels. Serving our community since 2011, JD Jewelers offers a large selection of jewelry, including handcrafted custom-made creations by Jason, who has been designing and creating jewelry for over 17 years. For Valentine’s Day, save 25% on sterling silver and diamond heart pendants, stating at just $75. Enameled sterling “Kiss” pendants, regular price $165, now just $100 for Valentine’s Day. Trinity Gallery & Gifts in Niceville offers unique gifts, art and home décor. Located at 703 Powell Drive, just one block off Partin Drive, Trinity Gallery and Gifts is locally owned and operated by Amy Ripley. For Valentine’s Day, choose from artworks created by local artisans, distinctive jewelry, pottery, a large assortment of teas, candles, bath and body works, and many more gifts for the spirit, soul and senses. This Valentine’s Day, treat your Valentine to a special Valentine’s dinner at Domodachi Japanese Steakhouse and Sushi Bar, located at 339 W. John Sims Parkway in Niceville, directly across the street from the Turkey Creek Nature Park. DoModachi is locally owned and operated by Kye Lin, who offers diners a tremendous assortment of menu items and takes great pride in serving generous portions at reasonable prices. The menu at DoMondachi features a large assortment of appetizers, soups and salads, Japanese noodle dishes, fried rice, and hibachi, Tempura and Teriyaki dishes. Choose from a wide variety of special dinner plates, dons (rice bowls), bowls and boats. Dinners range in price from about $12 to $25 (Chef’s Special Dinner).